The 2016 National Genealogy Society Conference will kick of in Fort Lauderdale, Floriday next week! If you haven't registered yet, it's not too late! Sign up here. The conference takes place from 4 -7 May 2016 and participants may choose from 180 lectures and workshops. Lectures will cover a wide range of local, regional and general genealogy topics which will help you build a solid foundation for your family history, fine-tune your research skills, and refine your methodology. Make sure to stop by our booth in the exhibit hall to pick up some great gifts (hint: if you're stressing out over brick walls, we have the item for you) and pick up some useful tips on researching your American, Irish and British ancestors. We'll also have our team of experts on hand, giving 3 classes a day on British and Irish records, PERSI, marriage records, newspapers and more. Make sure to arrive early! 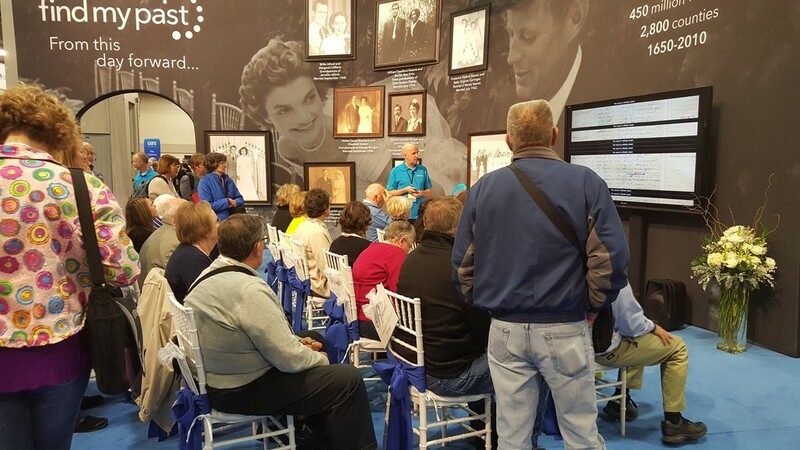 Our classes are usually "standing room only"
Findmypast has many different types of records to use, and our experts will show you how to get the most out of our premiere collections. Special guest lecture: Jessica Taylor, President of Legacy Family Tree Genealogists, will be sharing a special case study that will help highlight how to trace your roots back to England with Findmypast. She will be presenting at booth 525 on Thursday and Friday at 3:30pm. British and Irish records: Findmypast is home to the world's largest collection of British and Irish records online. Come learn about our exclusive collections and how they can help you meet the most common challenges faced by genealogists searching for their British and Irish roots. U.S. Marriages: In 2016, Findmypast will become home to the largest online collection of U.S. marriage records ever! We have already released 33 million marriage records and have over 70 million more to come, many of which have never been put online before. Learn how to search our collection and what you can find. Newspapers: Newspapers are arguably the most versatile record set a genealogist can use. Whether you're looking for names and dates or unforgettable stories, there's no doubt - your family was in the newspapers. Come see how to use our comprehensive collection of local U.S. newspapers and our collection of 13 million British and Irish papers as well. PERSI: The Periodical Source Index may be genealogy's best kept secret. This exhaustive index will help you locate your ancestors in one of the thousands of genealogy and local history publications in America. We'll also show you how we're revolutionizing PERSI by bringing the digital images of many periodicals online as well - it's no longer just an index! These lectures will be taking place on Wednesday, Thursday and Friday at 10:30am, 1:30pm and 3:30pm. Lectures on Saturday will be at 10:30pm and 1:30pm.